Pre-Season Match. Tuesday 8 August 2017. The Blues ended their pre-season fixtures with a victory against a young and talented West Ham side. The match was preceded with the debut of the Ricay’s Cheerleaders and the official opening of the Harry Parker Stand. 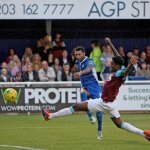 A massive 4,582 fans witnessed the match, breaking the 40-year-old record of 3,841 when West Ham United sent their first team down to New Lodge, with the visitors leaving 2-1 winners. Town took the lead through Billy Bricknell, scoring a header from close range. New signing Jermaine Pennant double the lead with a powerful drive in to the roof of the net. The Hammers started the second half brightly pulling a goal back before Sam Deering rounded off a strong Town performance by bringing the ball down in the area and passing it in to the net as the young keeper looked on. Julian, Chambers (Swaine), Konchesky, Ellul, Deering 1, Evans, Davies (Waldren), Bricknell 1 (Cunnington), Theophanous (Robinson), Pennant 1 (Modeste), Foley (Urquhart). The 2017-18 season finally kicks-off this Saturday and Craig Edwards brings his Kingstonian team to The AGP Arena.